5 Bedroom Semi Detached House For Sale in Banbury for Guide Price £699,950. Dating back to the 17th Century and steeped in history the name of the property originates from the French word 'Caracole' meaning 'spiral' and refers to the wooden spiral staircase set into a turret on the rear elevation. 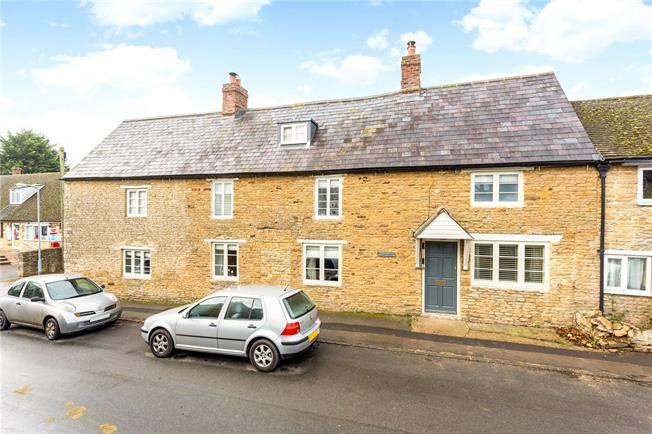 The property served as the village butchers until the 1960's and since then, it has been sympathetically restored and combines many period features with all the convenience of modern family living. Such features include deep window seats, exposed timbers, elm floorboards, reclaimed internal doors and stone fireplaces with Clearview wood burning stoves. In the past five years the current owners have overseen a complete renewal and insulation of the roof as well as a rebuild of the chimneys. They have also installed new hard wood windows featuring Heritage glazing. On the ground floor a large reception hall opens to a large country kitchen/breakfast room with a quarry tiled floor, bespoke hand built units, wooden worksurfaces and features an oil fired Aga. Alongside the kitchen an open plan breakfast area leads to a conservatory which overlooks the gardens. From the reception hall there are two formal reception rooms offering flexibility of use, each with fireplaces and wood burners. The 'Caracole' staircase leads to the first floor with three bedrooms, each with fitted wardrobes and a bathroom featuring a roll top bath and separate shower cubicle. The second floor accommodation comprises a two further bedrooms, a shower room, and is ideal as a guest suite or children’s bedrooms. Charlton is a sought after village with a range of amenities including a post office/village store, primary school, public house and church. Banbury and Brackley provide access for every day needs, whilst the larger centres of Milton Keynes & Oxford are both within close proximity. Train services to London Marylebone are available from Kings Sutton (approx 2 miles away) Banbury, Bicester North & Bicester Village. Schooling within the village includes pre school and primary with popular independent prep schools of Winchester House in Brackley, Beachborough in Westbury and Carrdus in Overthorpe. Secondary schooling can be located at Brackley and the independent schools local to the area include Bloxham school and Tudor Hall in Banbury. The south facing rear gardens are enclosed by stone walling and are principally laid to lawn with a flagstone terrace adjacent to the property. The lawns are complemented by well stocked flowering borders, box hedging, gravel pathways and a herb garden. Approached from the side of the property a shared driveway provides access to a brick built detached double garage and further garden area which has been cultivated and could provide a vegetable garden or offer scope for enlargement of the garaging (subject to planning consent). There is a right of access over a section of the driveway to the gate of the field behind the garage, with commanding countryside views beyond.